The Gimli trailhead parking remains closed due to danger as a result of wildfire in the area during the summer. No parking is allowed at the trailhead until further notice. This park was created to protect the diverse topography, majestic peaks and unique vegetation typical of the Selkirk Mountains. There are many opportunities here for the backcountry adventurer. Several beaches for boaters – some for waterskiers and others for canoeists. Varied and abundant hiking opportunities from short walks to wilderness treks and mountain climbing. The park has opportunities for a number of recreational activities including hiking, fishing and wildlife viewing. Camping is restricted to designated sites along established trails and on Slocan Lake beaches. Higher elevation lakes have been stocked to provide additional opportunities for fishing enthusiasts. Currently Evans Lake Cabin, Cove Creek Cabin, Evans Beach Shelter and Iron Creek Shelter serve as public shelters and offer accommodation in each for a maximum of four persons. A full range of commercial facilities are available at Slocan, Silverton and New Denver. Pets are only allowed on the Slocan lakefront sites, the Slocan to Evans Beach Trail and the trail to Cahill and Beatrice lakes and they must be leashed at all times. Pets are not allowed in any other backcountry areas of the park. The park is located on the west shore of Slocan Lake, north of both Slocan and Castlegar, and encompasses most of the Valhalla Range of the Selkirk Mountains. The park can be accessed by water, forest industrial roads or by trail. The nearest community to the park is Slocan and Highway 6 provides access to the town and other population centres in the vicinity. Public boat launches exist in a number of towns, including Slocan, Silverton and New Denver, by which trailheads can be easily reached. History: The park was designated March 3, 1983. The park was created to protect the diverse topography, majestic peaks and unique vegetation typical of the Selkirk Mountains. Cultural Heritage: Pictographs in the park are evidence of early native habitation in the region. It was not until the 1850’s that prospectors and surveyors came into the area. Slocan Lake became a highway of commerce for early towns in the Kootenays and remnants of the logging flumes and other transportation routes may still be seen in the park. Conservation: This area protects the diverse topography, majestic peaks and unique vegetation typical of the Selkirk Mountains. The park is unique in its varying topography. Both Evans Lake and Beatrice Lake are uncommonly large for high elevation lakes in BC. Surrounding the lakes are numerous mountains with castellated peaks. As well as forests of western red cedar and western hemlock, the higher elevations contain sub-alpine and alpine vegetation. Wildlife: A variety of wildlife exists, including the grizzly and black bear, mountain goat, mule and whitetail deer, cougar, Golden Eagle and Alpine Ptarmigan. 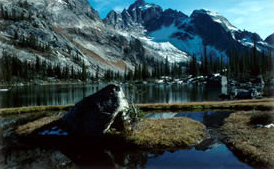 The Valhalla Provincial Park Background Report 2004 [PDF 1.0MB] provides natural, cultural and recreational information regarding this park and outlines issues addressed in the management plan. There are extensive hiking areas in this park. During the winter season, the trails are under snow. For your own safety and the preservation of the park, obey posted signs and keep to designated trails. Shortcutting trails destroys plant life and soil structure. Hunting is allowed in Valhalla Provincial Park from September 1 to June 30 during a lawful game hunting season. Please check the Hunting & Trapping Regulations Synopsis for specific details. Note: There is no hunting allowed in the Evans Lake Ecological Reserve, which is located within the park boundaries. Pets are only allowed on the Slocan lakefront sites, the Slocan to Evans Beach Trail and the trail to Cahill and Beatrice Lakes. They must be leashed at all times. Pets are not allowed off these trails or in any other backcountry areas of the park. You are responsible for their behaviour and must dispose of their excrement. Campfire pits are provided at established Slocan Lakeshore sites. Drinnon, Wicca and Gwillim lakes campgrounds have cooking areas but campfires are not allowed there. Where campfires are allowed and campfire rings are provided, we encourage visitors to conserve wood and protect the environment by minimizing the use of fire and using campstoves instead. Campfire bans may be implemented. To preserve vegetation and ground cover, please don’t gather firewood from the area around your campsite or elsewhere in the park (this is a ticketable offence under the Park Act). Dead wood is an important habitat element for many plants and animals and it adds organic matter to the soil. Boat accessible beach areas provide day-use or picnic facilities. Wilderness, backcountry or walk-in camping is allowed; however, no services are provided at the marine sites. The campsites are open year-round when accessible and are available on a first-come, first-served basis. There are facilities at Gwillim, Wicca, Drinnon, Emerald and Cahill Lakes.